Selected by the Horse-Journal as "Editor's Choice" and "Product of the Year". "It penetrates deeply then reacts with the hoof wall keratin to form additional links/bridges. It binds to protein to stiffen the keratin coil, helping prevent brittleness and cracks... it lasts and gets the job done." ~ Horse Journal Product of the Year. 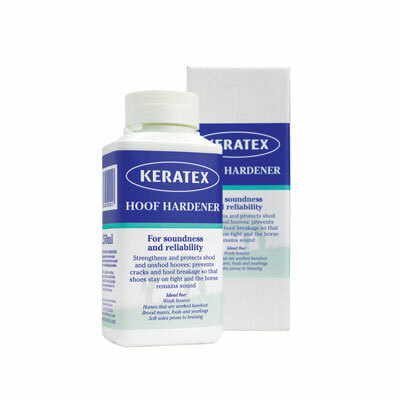 Keratex Hoof Hardener is a gentle acting formulation which forms additional intermolecular bonds between molecules of keratin through the process of cross-linking. Keratin is the main protein constituent of horn and is best described as the building block of the horn structure.